Music Therapy For Senior Citizens: More Powerful Than Medicine? 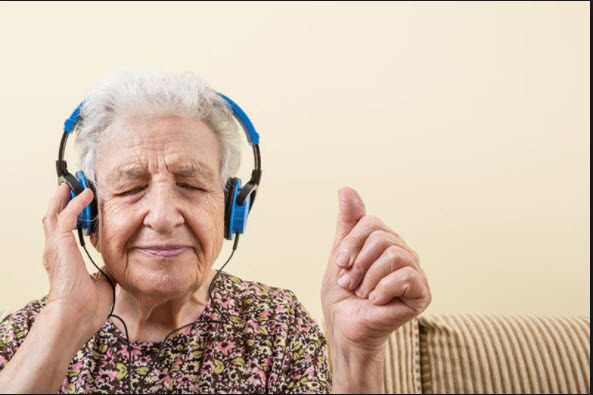 Music therapy for senior citizens may be more powerful than medication. Humans are governed by rhythms. They influence our heartbeat, speech patterns, as well as our sleep/wake cycles. Music, then, mirrors the ebb and flow of life. Music therapy can help seniors maintain their health, help them recall memories, and fight depression. The Older Americans Act of 1992 encouraged the use of music therapy to improve the social, emotional, and physical health of seniors. Speech skills: This therapy has been proven to help older adults answer questions, make decisions, and speak clearer. It helps to slow the deterioration of speech and language skills in dementia patients. Indeed, research shows that even when an Alzheimer’s patient can no longer speak, they can still hum or sing their favorite song. Stress Reduction: Some caregivers have difficulty managing their aging loved one’s stress and agitation. Playing songs helps to relax and ease the aggressive behaviors. Slow songs like ballads and lullabies can help to reduce agitation. Physical Skills: It inspires movement in seniors. With melodies comes dancing, after all. Moreover, it promotes coordination and can help with walking and endurance. It can also inspire toe tapping and clapping, thus getting the blood flowing once again. Social Skills: Increased social interaction with caregivers and others is another benefit this therapy can offer seniors. It encourages bonding with others, which in turn can help alleviate feelings of loneliness and depression. Music therapy can resonate with the elderly. Play the music of their favorite artists that meshes with a given activity. It’s worth trying, especially if it helps to improve their quality of life.